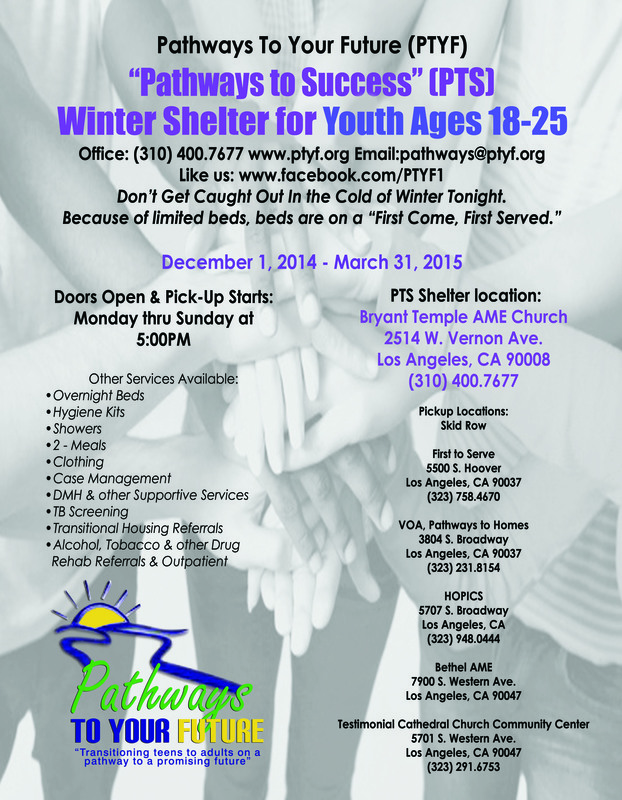 Pathways to Your Future has opened their Pathways to Success (PTS) Winter Shelter, specifically for youth 18-25 years old, from December 1st to March 31st. The PTS Shelter location is at Bryant Temple AME Church 2514 West Vernon Ave. Los Angeles, CA 90008. Pick up locations have been arranged with Skid Row, First to Serve, VOA Pathways to Homes, HOPICS, Bethel AME, and the Testimonial Cathedral Church Community Center. Doors Open & Pick-Up stars at 5pm. Complimentary services are also available.